Those who fancy ancient Greece-themed slots are welcomed to play this fascinating game! Nextgen, the developers of Medusa II, offer gamblers the opportunity to face Medusa, the once beautiful woman allegedly turned into a hideous Gorgon. Medusa II was developed by NextGen, which is an Australia-based gaming company. The company has created many games and has won accolades for being one of the best game developers in the gaming industry. Medusa II is a five reel slot that offers massive 243 ways to win. The game is a sequel to the very popular Medusa slot and is no different since it is based on the character from Greek mythology, Medusa. The game includes several features such as Turned to Stone Stacked Wilds and Medusa’s locked reels that can help a player get some cash winnings. This feature locks the reels together in such a way that they spin at the same time to reveal similar symbols. Those who are lucky can get some big wins through the locked reels. This is another feature that is activated by landing three or more of the scatter symbols anywhere on the reels. Players can get ten free spins with three or more scatter symbols. With some luck, this can reactivate five extra spins. It is the fun part of the game; a player can have a soldier fight Medusa. Medusa will win and turn the soldier to stone and thus creating a stack of Wilds on that reel. The player can get some great winning opportunities in such case. A player can either double or quadruple their winnings if they can predict either the card color or the card suit that will come up next. Players are able to gamble five times in a row. 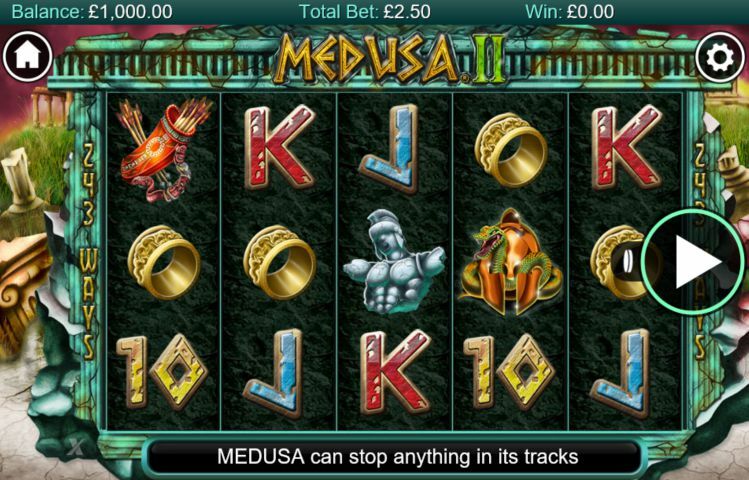 Medusa II is a great upgrade that will appeal to usual slots players and fans of the original Medusa game. Try it out on any NextGen casino for real money action.